I don't get why you're doing all these mental gymnastics just so Plateau can move one less time. Besides, by my count it only moves once, two if you count moving once in two timelines. At the end of the day, the GC map of TP is the canon one, and I don't see why you would want it any other way. It follows all the conventions of Hyrule's layout perfectly (aside from Zora's Domain); Death Mountain in the Northeast, Faron Woods in the South, Lake Hylia in the South(ish), Gerudo Desert in the Southwest, and Herba in the Northwest. I don't get what's wrong with that. So for Ordon-Faron it is a 180 deg rotation, but for the rests is more like ~100 deg rotation. As I said, non-uniform metric. Follow-up question: Why rotate Ordon-Faron to a different degree, instead of just placing it in the Tabantha region? Is it just for the trees? Not that that's a bad region, just wondering if there's more. 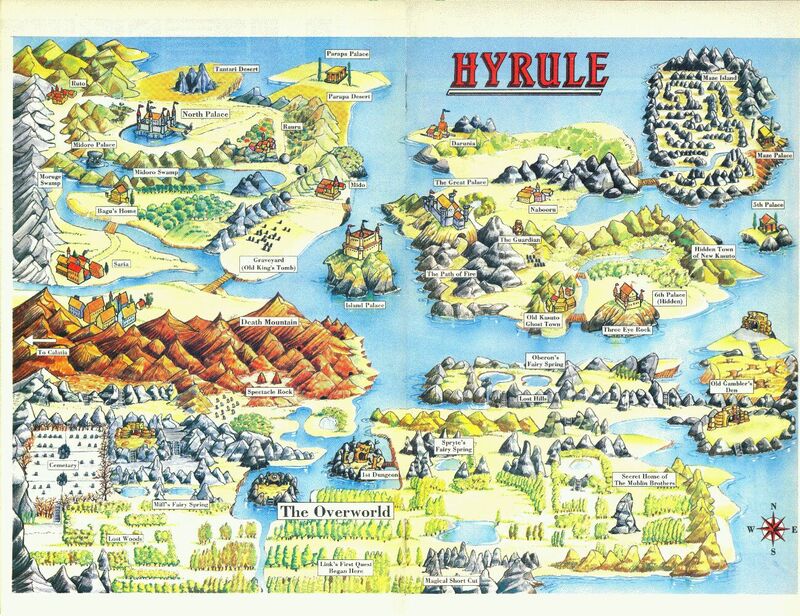 How literally should we interpret the size of ZELDA II's Overworld? There are several different theories as to how Zelda 1's map matches with BotW's. 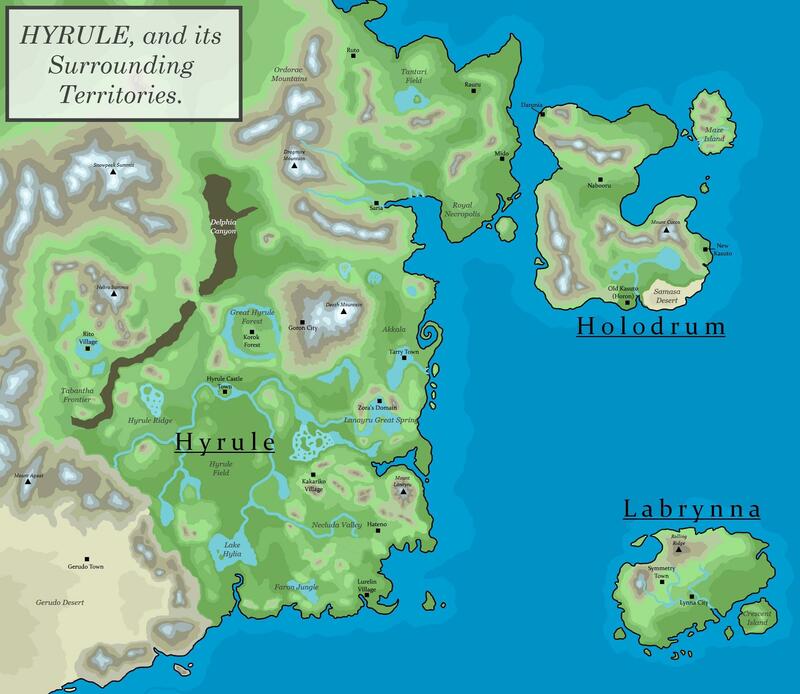 Though I'm personally of the belief it represents the Necluda, Faron, and Gerudo regions of Hyrule, there are people who would assert that Zelda 1's Hyrule takes up the space of Akkala or that the whole of BotW's map is a partially flooded Hyrule. In the latter theories, Zelda 2's map seems to clearly fit within the bounds of BotW's map. In the first theory? I think the northern/eastern sections are likely much, much smaller than they seem. There are a couple maps that illustrate this idea that I'd like to share. The post was edited 2 times, last by Chateau LonLon ( Feb 11th 2019, 6:21am ). Because I impose the master sword location to be one and the same through all the games. In this match, the MS has always been bound to the seal temple. So in my SS-BotW-OoT-TP model, the GP just move once. In more standard SS-OoT-TP-BotW or SS-OoT-ALttP-AoL-BotW models, the GP has to move at least twice. The case of BotW is more tricky ... we don't know where cas the MS. So this is a highly debatable question. I would put a coin on the idea that the MS wasn't with the Great Deku Tree. The pedestal there might have been created by Zelda with some magic just prior to the cutscene. One could say that the trial of the sword location shows that the MS pedestal is intended to be there. But at this point, so many Shrine are very circonstancially well placed, that I didn't find that a strong argument. Thinking a bit more about it, It works as well with putting Faron-Ordon in Thabantha, is just implies that the OoT Castle (so the GP) would have to be there too. Thus the GP is never on top of Korok Forest. It would change also a bit my cross-match with AoL, OoT-Castle might become North-Castle is this case. Was Demise Hylia's first chosen hero ? Why are Kokiris looking so Hylian ? One or Two timeline split(s) at the end of OoT ? Is the Old-Man from BotW an aged version of Ganondorf ? The post was edited 2 times, last by Guiguitargz ( Feb 12th 2019, 4:37pm ). Oh, right, forgot about the Master Sword. I've never been a big fan of this match, which is based to a one-location match : death mountain. It gives the impression to just patch two map together just matching one mountain. The north part is not fitting BotW, the big Islands on the east cannot be seen from BotW map. However, the Idea of OoX regions being part of AoL map is interesting. If OoX-Link is a completely independent one, we don't know "his Hyrule". Thus, maybe the Hyrule of that time is smaller, leaving space for OoX regions to fit within BotW map too. Damn where do you get all the energy from doing this lol? Especially @Guiguitargz. Looks exhausting matching everything up like this, or it is just me being uninterested in map-matching. I am impressed though. What do you prefer, a new big open world game that expand the Hyrule map even further and introduces new provinces, or an equally big game but keeps BotW's map and introduces another continent/land? Personally I am probably fine with both, but would be cool with a future Zelda that is like 20 times the size of BotW, and give us the entire continent of Hyrule with surrounding water all around as the "invincible walls". But at the same time, a map with that size sound "pretty" daunting. But hey, as long as it is good I wouldn't mind it I guess. Today it may sound impossible, but I remember back in 2003 where it felt impossible to get a "traditional" (based on mostly land) that were as big as the entire Great Ocean, and here we are now with BotW. So who knows? Perhaps a gigantic Hyrule will be possible in the future. And I am not talking technically, but rather in a practical sense. It sound like an extremely big effort (at least if the game is going to be good). But strongly doubt that the Switch could handle even half of that ambition. Maybe the next console? But honestly, even a future Zelda that were the doubled size of BotW feels huuuge to me, considering that I thought BotW was really big. Hum ... took me one hour top ... and I'm insomniac , it helps a bit. What do you prefer, a new big open world game that expand the Hyrule map even further and introduces new provinces, or an equally big game but keeps BotW's map and introduces another continent/land? Bigger ! Size matters, the one telling otherwize are lying ! For me the good point it that the world is filled with things to do. Space for space is useless. The Master Sword moves, as it's clearly in the same spot in OoT and ALttP as in SS and TP. Occam's Razor tells me it's the ToT that moved, not the entire land around it. That matchup you complained about is perfect, and based on more than just Death Mountain. Lake Akkala is clearly Spectacle Lake from HF. For instance, if you consider that TP and SS have the same location for the MS, but that OoT have a different one: you need the MS to move between SS and OoT, and then to move again to go back to it's original location between OoT and TP. Didn't sounds like the easiest explanation to me. Also, the ruins surrounding the ToT in BotW are very close from Market town in OoT. But the location, in a standard match, is more the one of TP. Thus, I would find more easy to claim that the GP moved, compared to claim that the same exact city has been build at two different location. So the apparant similar size of Korok Forest and GP suggests that the whole GP moved, not only the ToT. I still found the matching of TLoZ-map with the southern part of BotW-map more convincing. You say it is "clearly", but one could say that TLoZ-lake is clearly Lake-Hylia . 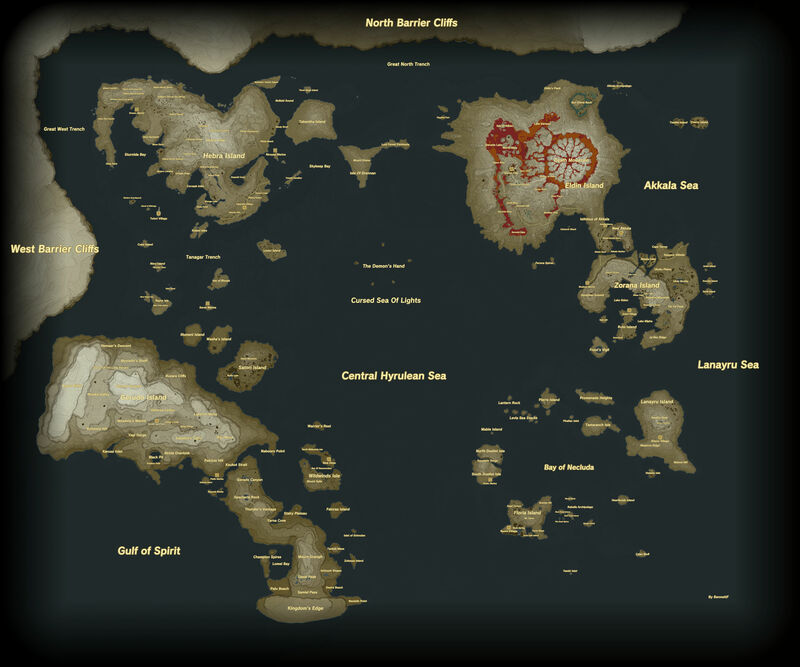 And in your "perfect" ( ) match, where is the "giant island" that should be north-east to BotW-Hyrule. It is nowhere to be seen in BotW. Didn't look perfect at all ... like any geography-match in Zelda Universe. So this matching, based on AoL death mountain isn't that convincing, it is just patching two different maps together. If it was the intention of the devs, it would have been easy to put an island in the north-east that we can't reach ... but there is not island there. It makes this match not very convincing to me. Well obviously it's the entire GP that moved. The post was edited 1 time, last by Kokiri Kid ( Feb 17th 2019, 2:03pm ). @Kokiri Kid Haha no, but I have seen his maps, and I tend to agree with his line of thought. I used to be into the GP movement theory, but when I actually cut and paste the landmasses to swap around I just couldn't find a convincing enough looking orientation. Not to mention, the GP in BotW has roads leading up to where the Castletown Gates would be if the whole island was lowered. It seems to imply that the GP has been here for awhile, and has just recently been shifted up for some reason. It seems to imply that the GP has been here for awhile, and has just recently been shifted up for some reason. I didn't think it has been shifted up. The entrance of the GP is at the level of Hyrule field (just blocked by rock and with a water body having formed). The entrance is in fact way below the rest of the plateau, which may give the impression that this entrance have been "adapted" following a potential displacement. That would explains why this entrance is not the same than the one in OoT. It is a new entrance build after the GP displacement. The post was edited 1 time, last by Guiguitargz ( Feb 17th 2019, 2:39pm ). Lake Akkala is clearly Spectacle Lake from HF. I'm interested in this. Please elaborate? On an unrelated note (but still related to this thread), does anyone have any ideas about Zirco Mesa? It's always covered by clouds, but there's nothing really of note there. The post was edited 1 time, last by SamCringe ( Feb 23rd 2019, 8:14pm ). That actually used to be one of the reasons I subscribed to the Lost Woods swapping theory, but the timeline of events for it was absolutely nuts! Also, that second map is really yours? I've always loved it, haha. I thought about using it for a Zelda DnD adventure awhile back! I didn't realize you were under the impression of Akkala being NES Hytule tho, I assume you were using Death Mountain as a match for the Death Mountain Area in Zelda 2! It's exactly what's presented in SamCringe's map. Has anybody given any thought as to how the world of Wind Waker would look reinterpretted with the Breath of the Wild map? I imagine it would need considerable warping, and many of the "unnecessary islands" wouldn't have a correlation. Right now I'm looking at someone's flooded BotW map and roughly arranging some of WW's most story-centric islands around it. I imagine Outset Island corresponds to the Dueling Peaks, Ice Ring Isle to Mt. Lanayru, Dragon Roost Island to Death Mountain, and Spectacle Island to the Gerudo Desert's Spectacle Rock. Some of these matches are considerably warped around the map, but I've been approaching this quite simply. I am comparing the intentions of WW's map to the layout of OoT, and then comparing that to BotW. By doing this areas such as the Forbidden Fortress will fall into the Gerudo Desert instead of somewhere like the Hebra mountains simply due to geographical location. This is the base map I would like to use.